We celebrated our 40th birthday last night and POLITICO Influence has the intel on the fête. OVER THE HILL: Cassidy and Associates marked 40 years last night on the roof terrace of the Hall of States Building overlooking the Capitol and Union Station. Founder Gerry Cassidy and his wife Loretta joined the firm’s current Co-Chairmen Kai Anderson and Barry Rhoads in welcoming Sens. John Cornyn (R-Texas), Ed Markey (D-Mass.) and Roger Wicker (R-Miss. ); Reps. Jim McGovern (D-Mass. ), Bill Keating (D-Mass. ), Katherine Clark (D-Mass. ), Donald Norcross (D-N.J.), Frank Pallone (D-N.J.), Duncan Hunter (R-Calif.), Steven Palazzo (R-Miss. ), and Mark Takai (D-Hawaii); Marty Franken and Ranny Cooper of Cassidy sister company Powell Tate/Weber Shandwick; former Commandant of the Marine Corps Gen. P.X. Kelley; Cloakroom Advisors founder and principal Gregg Hartley; Prism Public Affairs founder Dale Leibach; and Venable partner Greg Gill. The signature cocktail featured cranberry juice from longtime client Ocean Spray. 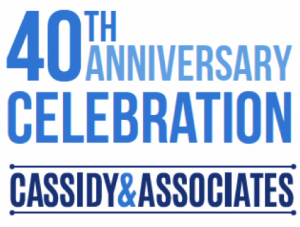 “Lobbying firms, most can’t survive two months, let alone 40 years,” Cassidy said.